At A&A Computers we want our business partners, prospective business partners and employees to know that we conduct our business in an ethical, transparent and upstanding manner, and reject any business opportunities that involve bribery or other fraudulent actions. We consider compliance with anti-bribery laws to be more than a legal requirement. Compliance is also a reflection of how our company values are embedded – the basis for the behaviour by which A&A Computers wants to be judged by society. Our employees are required to observe and adhere strictly to Tanzanian anti-bribery laws and regulations. Our code of conduct puts compliance and our legal obligations ahead of our business results. 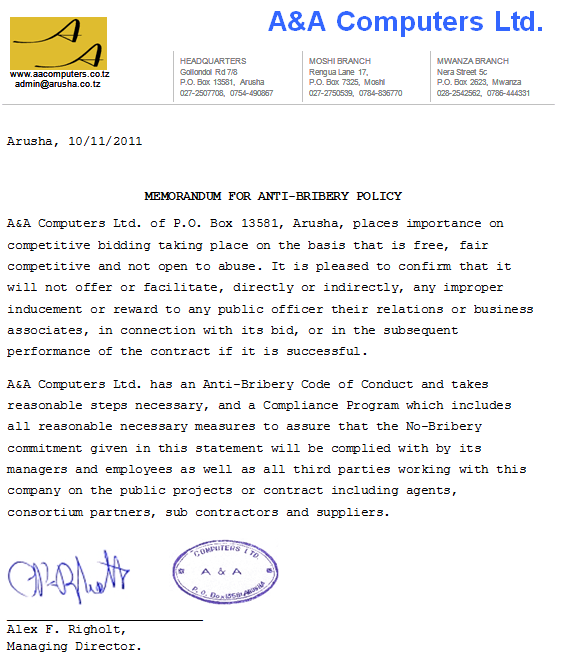 A&A Computers Ltd. will discipline any employee who violates any anti-bribery laws. Send us your Purchase Orders directly, preferably by email. We will send you an accurate proforma invoice within one working day. Do not send your employees to collect proforma invoices. Close association with our employees may cause inflation of invoices, and soliciting of fraudulent payments. Check our up-to-date prices listed on this web site, so that you can verify that you are charged the set prices, avoiding inflation of invoices. See our physical addresses and telephone numbers here. Please call us to see that the telephone numbers are correct and working. Send us an e-mail to make sure the e-mail address is active. Read about returns and warranties. Be aware of Fraud Indicators, listed below. If you have questions or concerns, please let us know. Following are indicators of fraud, or of attempts to commit fraud, in procurements and tenders. These fraud indicators by themselves do not establish the existence of fraud. Instead, the presence of any of these fraud indicators should alert us to the possibility of impropriety, and requires appropriate actions to ensure the integrity of the procurement or tender process. Baseless complaints or accusations by an employee addressed at A&A Computers Ltd. The employee is unhappy not having received any kick-back, and wants to ensure that another, less ethical, supplier will be selected for future orders, or to direct business to a member of a family or a close associate. Employees claiming not having received a hand-written and stamped receipt for the full amount from A&A Computers. Part of the total amount may have been diverted by the employee. Being given a Purchase Order for A&A Computers, but purchasing the goods elsewhere. The other supplier may issue a kick-back and supply sub-standard equipment, equipment lacking warranty, or equipment without after-sales service. Purchase orders are tailored to meet the qualification of one particular supplier or product. Technical requirements not based on clear requirements or with an unnecessary number of restrictions aiming at reducing competition. Timeframe not consistently applied to all suppliers. The buyer demanding unreasonably high Security Bonds.